The Norco facility has long been one of Shell's most profitable chemical plants. But to remain profitable and competitive, Shell realized several years ago that it would have to update its instrumentation and controls. Also important were initiatives to reduce maintenance costs and, above all, meet the "bottomline" goal of reduced steam-per-unit output for the entire plant. Shell entered into a business partnership with the control system supplier to transform a largely pneumatic instrumented plant into a fully digital plant using FOUNDATION fieldbus (FF) technologies. That investment at the ethylene plant in Norco, Louisiana, is paying off with significant results. The essence of Shell's decision was to replace its legacy pneumatic control system with an integrated production control system. With about 9,000 fieldbus devices, the Norco plant is one of the largest FF installations in North America. It is eclipsed within Shell only by a similar control system at the Nanhai project in China with its approximately 30,000 FF field devices. Shell Chemical's plant and adjoining refinery occupy about 1,000 acres in Norco, Louisiana on the outskirts of New Orleans. The chemical plant manufactures olefins (ethylene, propylene, butadiene), aromatic feedstocks and polyolefin feedstocks. It produces about 9,000,000 lb/year of ethylene. It has the flexibility to take ethane or naphtha as feedstock and optimize production to either chemicals or to blends for gasoline or diesel fuel, depending on market conditions. The plant has three main processing units: OL-5 with 14 gas- and liquid-feed furnaces, GO-1 with nine gas-feed furnaces and OP-1 with one furnace. Significant operation and maintenance benefits through predictive maintenance provided by FF and asset management technology. Improved hydrotreater steam shedding. Before: Plaguing operators with the plant's legacy pneumatic system was the time needed to bring a gasoline hydrotreater (GHT) down. Previously it took about 20 to 30 minutes with careful operator control of the process. After reinstrumentation: The new fieldbus control system automatically controls steam shedding and reduces the time to about five minutes. Furthermore, alarms were reduced by a factor of four. Operator acceptance: An interesting and significant "by product" of this improvement was the enthusiastic acceptance by the unit operators. Word of the new control capability quickly spread and resulted in a number of requests by other plant operators for the GHT position. In addition to making operation easier, the new system appealed strongly to an operator's desire to operate safely, efficiently and with minimum risk to the process. Improved heavy-gas stripper reflux flow. Before: Flow was highly variable with frequent alarms. After reinstrumentation: Variability and related out-of-limit alarms were greatly reduced, Fig. 1. This resulted in smoother operation with fewer upsets to downstream units. Fig. 1 Highly irregular flow before instrumentation (left) was changed to the smoother flow within limits (right). The difference in the y-ordinate scale reflects unit change from Mbbl/d to bbl/d. Similar improvements in aromatics stripper reflux. Very similar changes in aromatics stripper reflux flow were achieved, as shown in Fig. 2. The same notes apply as for the proceeding graphs. Fig. 2 Similar changes were achieved in the aromatics stripper reflux flow (same notes apply as for Fig. 1). Significant improvement in steam usage. A key variable for GHT operation is steam usage. Fig. 3 shows a depentanizer operation for about a year. 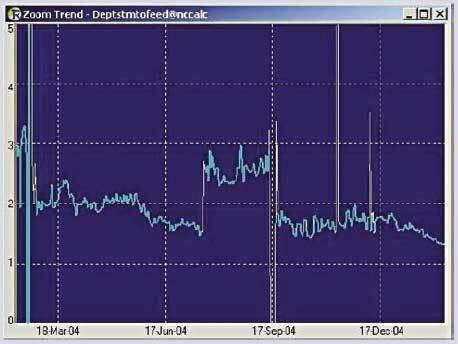 After December 17, 2004, when the reinstrumentation system was started, a clear trend toward lower steam usage with reduced variability can be seen. started dropping and showed much improved stability. Import steam to the GHT and overall steam-to-feed ratio showed similar results (Fig. 4). Improved steam condensate drum operations. Before: Problems with any of the many boilers in the GHTs meant trouble for the related GHT process. For example, steam condensate drums had to be drained or bypassed several times every day because of variability of several condensate streams to the drum. After reinstrumentation: Flow to the steam drums was stabilized. As a result, operator intervention was reduced, and the number of alarms produced when flow was out of limits was reduced to near zero. Reducing alarms help operators focus on true key alarms instead of responding to nuisance alarms, thus minimizing the problems of alarm overload. Constraint limits were tightened and flow volume increased to again improve plant efficiency. Detecting and remedying valve malfunction. Before: Until reinstrumentation, operating information from the pneumatic system was insufficient to determine operability of field control devices. After reinstrumentation: Better information from the new system indicated that two control valves were not functioning properly. Onsite observation revealed one was sticking, and the second had a ruptured diaphragm. With appropriate maintenance to get the valves operating properly, unit variability was reduced to allow a resulting improvement in steam-to-feed ratio. is because a steam meter was not in service. Improvements in flow variability to Shell's refinery. Ultra-low sulfur gasoline requirements for gasolines made in the contiguous Shell refinery unit indicated the need for control modifications to the Norco plant's GHT units. Shell and the control system supplier engineered the required change while not altering the basic control displays and schemes already familiar to operators. After reinstrumentation: Based on data to date, Shell anticipates output variability will be reduced by about a three-to-one ratio. Improvements in decoking. Before: The plant faced two problems with boiler coking: unstable operation and short decoking cycle times. Three to four days are required to decoke a unit. After reinstrumentation: Stabilized flow allowed increased feed to furnaces so output could be increased. In addition, the decoking cycle is expected to be significantly lengthened. By fine-tuning system control, coking is less severe and more gradual so furnaces now operate more efficiently and longer before decoking. Early detection of excessive steam tracing. Situation: To keep flow in a vapor state and to prevent freeze-up in some lines, the plant needed to install steam tracing. The operation involved considerable time and money. Both light and heavy tracing were to be installed, but better field data were needed to know which to select for each traced line. After reinstrumentation: Temperature data obtained from the FF instruments for an initial installation of tracing revealed that heavy tracing was producing excessive temperatures for some lines. Had the problem not been discovered, installation time and cost would have been wasted in replacing heavy tracing with light. Overheated transmitters would have required maintenance or replacement. Also, safety concerns would have been impacted. Production capacity was close to maximum, and the plant needed to explore ways to improve operations such as increased stabilization for various units, extended decoking cycles and overall improvements related to steam-to-output ratio. Pneumatic field instruments were becoming obsolete. Parts were increasingly hard to locate. Repair was difficult if possible at all, delivery slow and the cost of new pneumatic equipment rising. An advanced automation system would afford the potential for significant improvements and savings in the plant's already efficient operation, maintenance, safety and flexibility. Inevitable future changes could be accommodated more easily. Advanced process control (APC) could potentially yield significant benefits by enabling units to run closer to specifications to increase yields and reduce utility costs. Asset management capabilities would yield significant benefits by reducing preventive maintenance activities and providing early warning detection of device problems. With these factors in mind, Shell thoroughly evaluated the latest technology developments — especially with regard to redundancy, power system robustness and emerging DCS and safety system standards. The final recommendations to management for vendor and system type needed to be backed up with as much "hard data" as could be practically gathered by focusing on quotation requirements and procedures. Total life cycle costs needed to be presented. A key requirement was that the new reinstrumentation system use existing control schemes from the legacy pneumatic system. Shell established two metrics for competitive proposals. The first was based on feedback from Shell operators. Selected operators visited and actually helped operate plants using systems similar to those being considered. These operators reported on functionality, ease of use and other factors. The second metric was system cost. Shell asked all vendors to present a life cycle investment cost, the total cost for 10 years of use. This single, total figure was to include the cost to purchase, ship, install, operate, maintain and update the system. Also to be included were the costs for operator training, license fees, PC replacements over the 10-year period, and anything else related to the system. In addition to this single "bottom line" number, the vendor had to ensure response to calls within 12 hr or less at any time. Furthermore, parts delivery had to be within 24 hr after an order was placed. The basic concept in implementing the system was to first analyze each segment of the overall system. Next was to convert selected "isolated pockets" throughout the plant and observe results before installing the remaining basic infrastructure. Then sections of the plant were sequentially switched over from the old pneumatic system to the new FF system online — a "hot cutover." What then remained was to take advantage of the new system's capabilities, particularly changes that could not have been implemented with the legacy pneumatic control system. An example of system analysis is how control valves were classified in three categories according to how critical each was and whether or not its controller could be calibrated on the fly. Valves that could not be calibrated during use were calibrated at the first unit turnaround. Since installing FF requires identifying critical loops upfront, operators were involved early. This was later very helpful in operator acceptance of the new system. One of the most significant capabilities of the new system— advanced process control (APC) —offers the potential advantages of more consistent production, process optimization, less reprocessing or waste and related reduction in operating cost. APC in the system includes such concepts as feedforward or cascade control, time-delay compensation, adaptive schemes, sophisticated optimization strategies, predictive constraint control and multivariable control. A strong advantage of the FF control system is its ability to provide detailed information on the current condition of field devices plus predictive maintenance guidance. Early warning of potential field device failure helps prevent unplanned shutdowns and potential catastrophic failure. It also provides convenient options for the time to replace or service instruments and other field devices. The system features integrated displays to make operator monitoring and intervention easier and faster. The new central control system will improve information presentation for operators. Max Medina is a process engineering & control systems manager with Shell. He has been with Shell for 15 years; his current assignment is at the Shell Port Arthur refinery. Dr. Medina worked as optimization engineer at olefins and gasoline blending units and also held several assignments as control systems and instrument engineer for projects. His latest assignments include control systems manager and location representative in charge of commissioning efforts for reinstrumentation projects at Shell Norco. Dr. Medina holds a BS degree in chemical engineering from the University of Puerto Rico, and a PhD degree in chemical engineering from the University of South Florida (research on multivariable control). Constantine Lau is general manager of marketing for Yokogawa Corporation of America and is responsible for those functions within the systems marketing unit and corporate communications department. He worked previously at Dresser-Rand and Aspentech in marketing management roles. Mr. Lau has been with Yokogawa for three years. He holds BS degree in mechanical and petroleum engineering from the University of Texas at Austin and an MBA degree from the University of Houston. He can be reached at e-mail: constantine.lau@us.yokogawa.com.